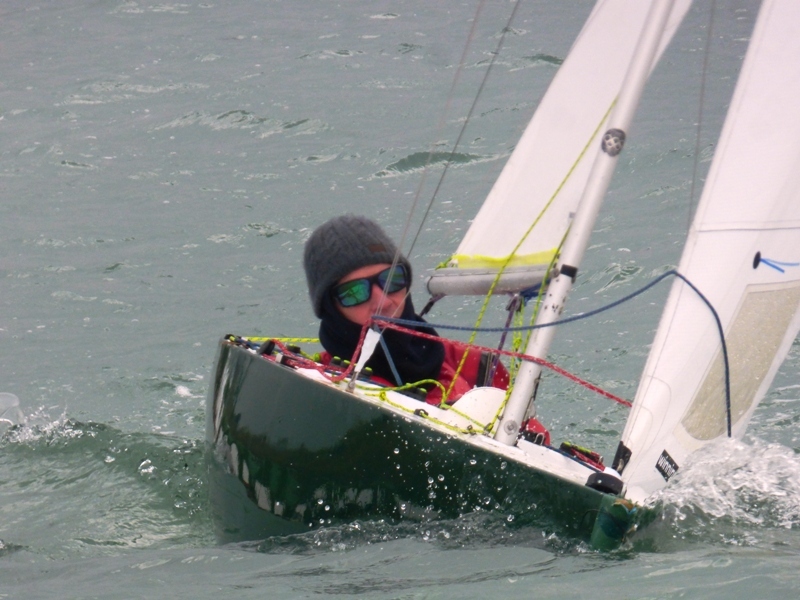 “The forecast on Saturday morning was wet and a F3 Easterly – it did not disappoint! That said, its only the Race Officers who tend to suffer when its wet, so it did not put off the seventeen helms who launched for the first day of the weekend’s ‘Bailey Bowl’. Unusually for this time of the year, there were no boats still on their moorings in the harbour so course setting was pretty straight forward. The first race got away to a clean start with Mark Downer & Bruce Huber (and others) within inches of the line when the hooter sounded. Most of the fleet kept on starboard across to the St Helens shore and after such a compact start it was slightly surprising to see Mark’s pink spinnaker well out in the lead as headed back downwind to the leeward gate. Raymond Simonds & Bruce lead the chasing fleet with David Russell-Jones, Jo Downer and Julia Bailey (in her first race of the season) not far behind. Despite their best efforts, Mark extended his lead so the race was finished at the end of the second round. There was another excellent start for the second race and it was Bruce’s green spinnaker that led the fleet back down the run to the leeward gate. However Mark was never very far away and took the lead as they started the second round. After some close racing, Bruce had to make do with second place ahead of Julia. Fourth, after an excellent race was the Class Admiral, Robin Ebsworth. 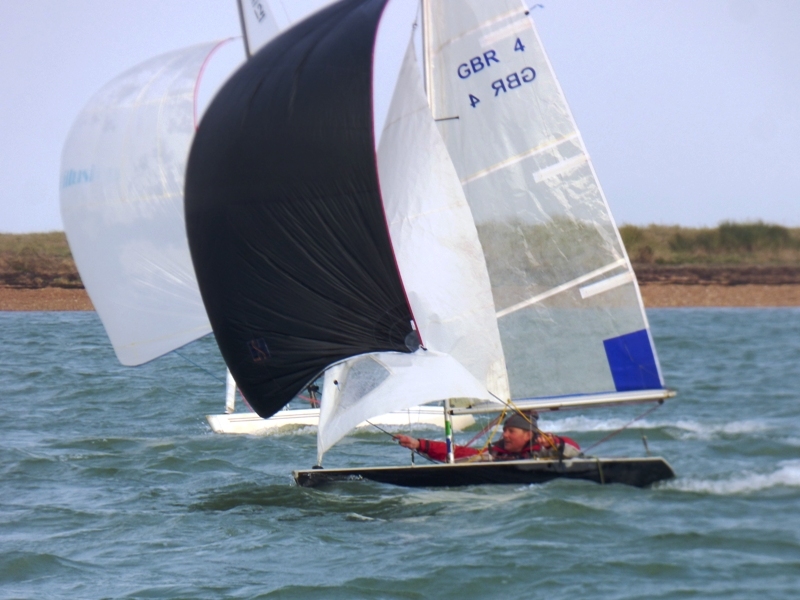 With a number of boats finishing very close at the far end of the line, Philip Russell, David Russell-Jones and Hugh Doherty were scored 8th equal as it was impossible to split them! 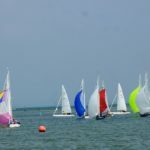 The start of the third race was another excellent demonstration of the close racing that the Bembridge fleet has become renowned for. At the front it was again Bruce & Mark, but this time Bruce managed to hold onto his lead in another two round race. Despite best efforts Julia could not find the extra pace to overtake Mark but she did well to hold off Raymond, Jo and David to take third. With Sunday’s forecast not looking too promising, it was decided to run a fourth race just to be on the safe side. 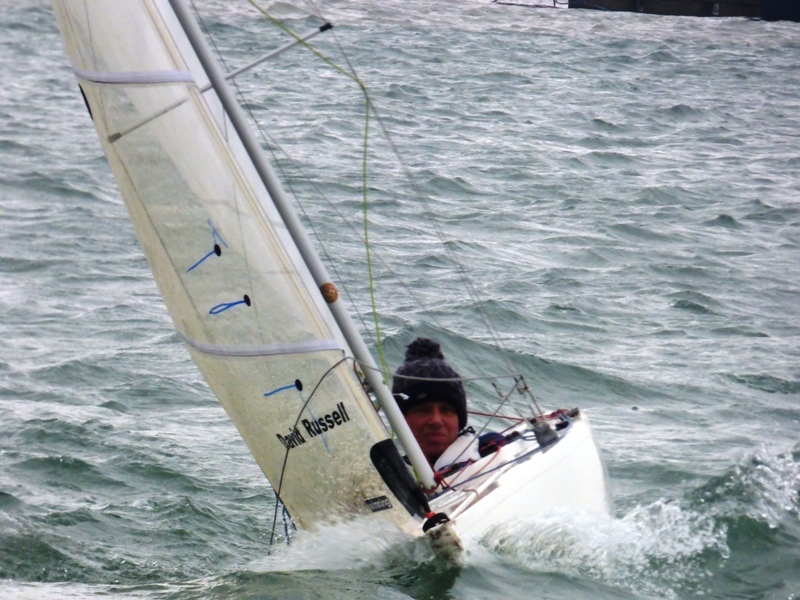 Had it been the first race of the day it probably would have been a General Recall, however in the event the only boat well over the line at the start was Jo Downer who quickly returned and subsequently did well to claw back to finish the two and a half round race in sixth place. 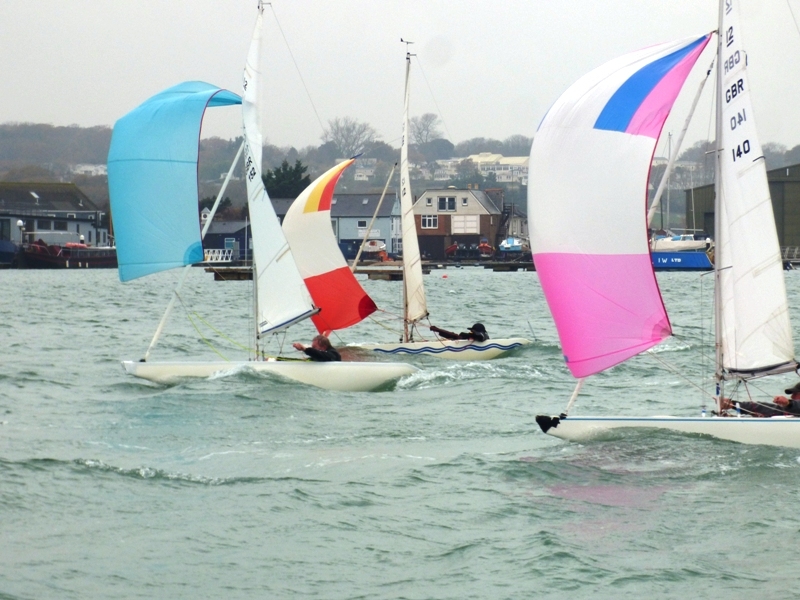 The two pink spinnakers of Mark & Julia dominated the front of the fleet with Bruce managing to hold off Philip and Raymond who finished within inches of each other. 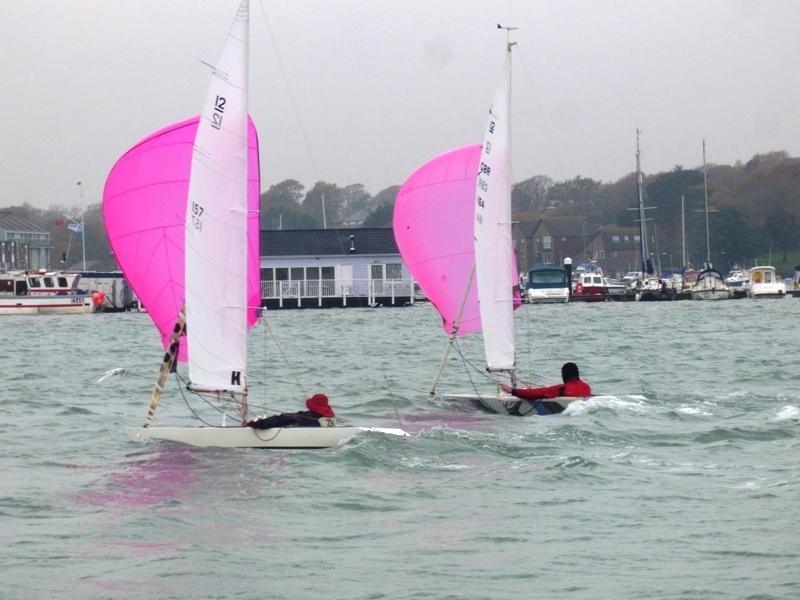 An excellent morning with some very close racing all the way through the fleet despite the rain! 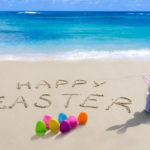 Although still quite cold, conditions on Sunday were considerably better than forecast; indeed the sun was even shining for most of the morning. 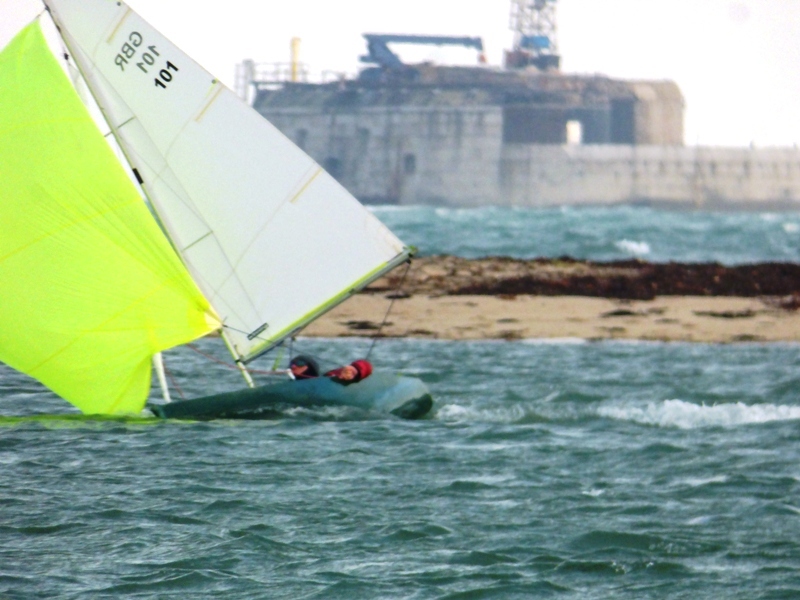 With the F4 breeze remaining from the East, the course was almost identical to the previous day. 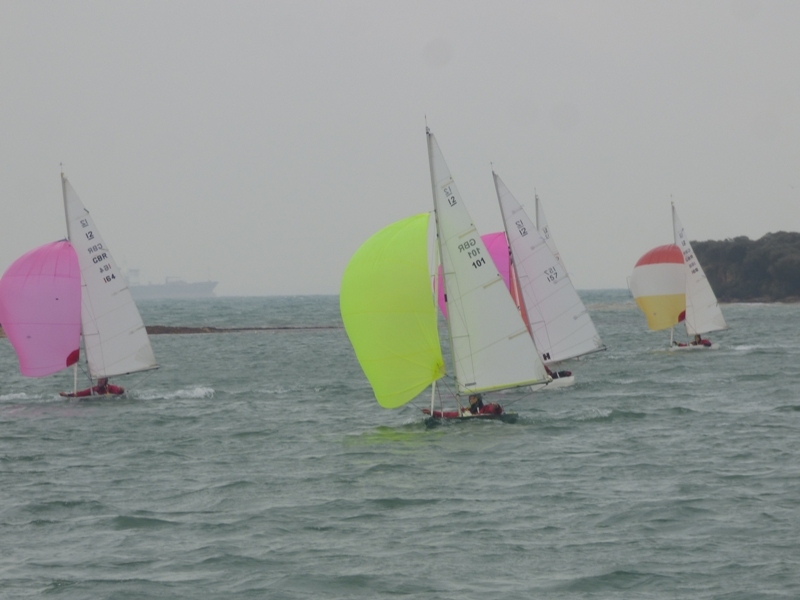 The first race got away after a short postponement to a clean start. With the majority of boats, as they had done the previous day, continuing on starboard towards the St Helens shore, Bruce Huber was first to the windward marks located close to the harbour entrance and built up a considerable lead on Mark Downer, Jo Downer , Raymond Simonds, Simon Cooper and Philip Russell. However his lead was almost thrown away near the top of the second beat when he cut things too fine and went aground on Attrills Point. 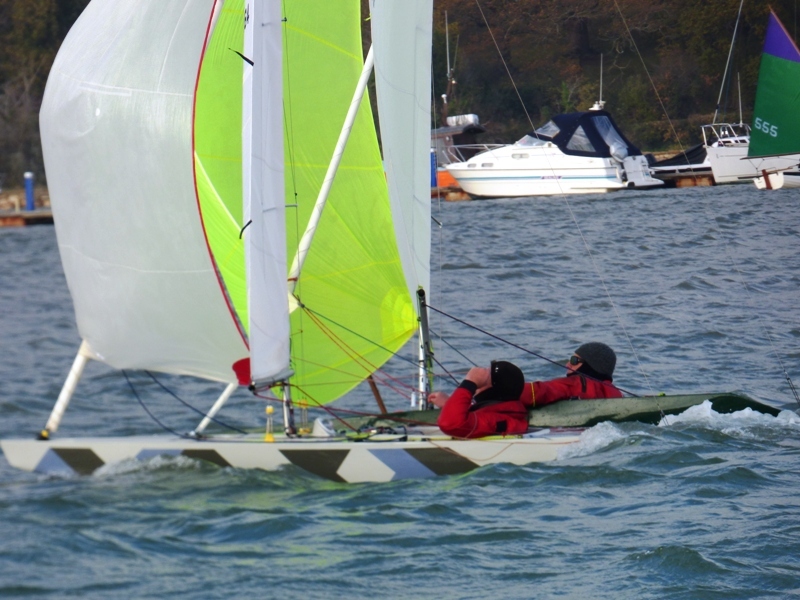 Fortunately by heeling his Illusion he was able to sail clear and although they were only inches apart on the run to the leeward gate (with numerous calls of ‘proper course’ from both sailors! ), he managed to keep ahead of Mark and finish first. Jo was third and Julia was fourth. The second start was a bit messy with Philip finding himself well over when the hooter sounded; although not by nearly so much Bruce was also called OCS so by the time he had returned he found himself well down the fleet and very much in catch up mode. Mark built up a considerable lead ahead of Jo and Raymond and never looked under much pressure, so the close racing was for the lower places. Indeed the big question was whether Bruce was going to be able to make up enough ground to finish in the top three. 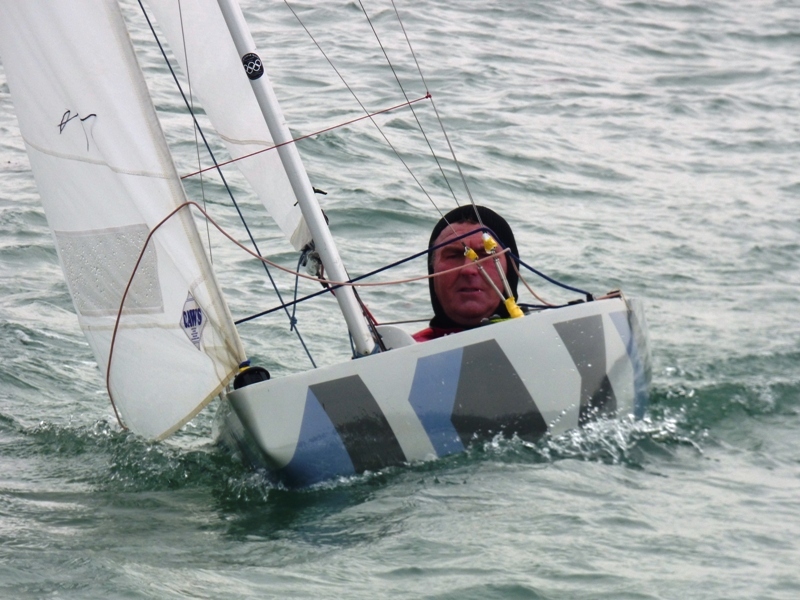 The answer came in the final 200 metres to the leeward gate on the penultimate leg of the race when he powered through Jo’s defences to get into second place. Raymond was fourth and Julia was fifth. With gusts of 18 knots at the start of the third race of the day, it was always going to make for some interesting video footage, particularly when David Peerless fouled Bruce and they both ended up entangled at the back of the fleet! As David was overheard to say when he eventually crossed the start line ‘not one of my better starts’! 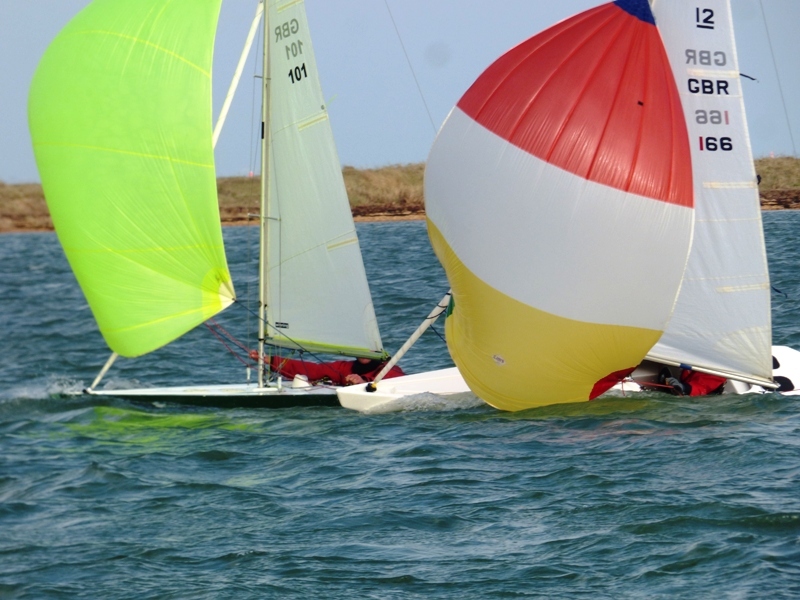 Julia rounded the windward marks with a substantial lead, however Mark reeled her in on the second round and took his fifth first over the weekend. Jo was a close third and Raymond was fourth. Although a number decided that they had had enough and headed back to the Illusion Quay, ten boats had a fourth race. After a clean start, with Bruce demonstrating inch perfect timing, it was Mark’s white spinnaker that led the fleet back down the run ahead of Julia, Bruce, David and Philip who were all working hard to maximise the pulling power of their spinnakers. Although Mark never looked in trouble, the other positions changed quite often, so second and third were always going to be close. In the event Bruce was just too consistent and took second ahead of David with Julia in fourth. 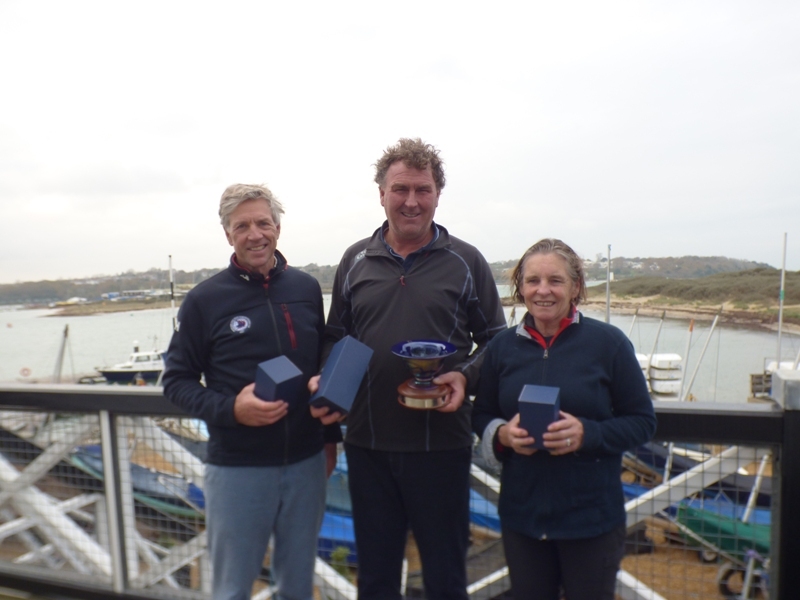 An excellent couple of days racing; interestingly the top three (Mark, Bruce and Julia) finished in exactly the same positions in last year’s ‘Bailey Bowl’. 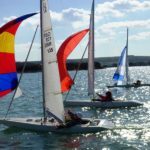 No racing next weekend as the tides are wrong; the following one (8th & 9th December) is the annual Inter Club Team Racing Championships.